So the end of TopTV has arrived. Today marks the platform's final day operating as it has since it's original launch. Tomorrow (Friday, 1 November) the satcaster changes name to StarSat. On Digital Media in partnership with StarTimes has today officially launched new pay television platform StarSat, previously operating as TopTV. StarSat’s tagline encourages South Africans to "Change your view" from the traditional to the exceptional. StarSat offers a revolutionary, cutting edge technology viewing experience, backed by some of the most internationally renowned television brands. According to ODM’s Interim CEO, Mr. Eddie Mbalo, the entry of StarSat into the pay television market “promises a new viewing experience”. He added that the channel would offer a range of programming from entertainment to news to education. Customers who have TopTV decoders will still be able to use and receive the StarSat signal, or if they choose to upgrade, they can buy a new StarSat HD decoder. Viewers whose subscriptions have lapsed will just need to contact the call centre to reactivate their subscriptions with the new StarSat package. 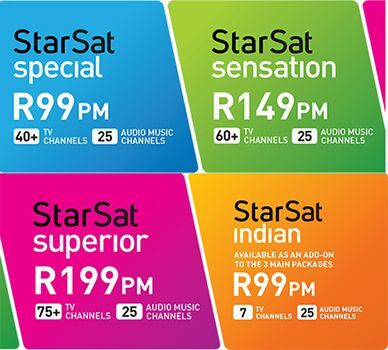 StarSat has introduced a range of new packages and channels- and new pricing structures - which will be available to subscribers as of 01 December 2013. ODM’s soon to be strategic equity partner, the StarTimes Group, has an extensive African footprint, with over 2,5 million Digital Terrestrial Television (DTT) subscribers across the continent and brings with it a wealth of technological know-how and expertise in emerging television markets. StarTimes recently signed a 10-year contract with satellite company, SES, to expand its media footprint in Africa through StarSat. This provides ODM and its partners with an opportunity to expand the pay television offering to the rest of the continent at an affordable rate. South African shareholders will retain a majority stake in ODM, with StarTimes owning a legally prescribed 20% stake in the business upon the implementation of the business rescue plan. On Digital Media is currently in the process of concluding the implementation of the Business Rescue Plan, as voted on and adopted by its creditors and shareholders on 30 April 2013. This is a legally binding process that allows for the company to continue to operate in the normal cause of business and to be restructured within the protective bubble of business rescue as per Chapter 6 of the Companies Act. On Digital Media (Pty) LTD (ODM) is a proudly South African incorporated company with effective BEE shareholding of 68%. The company was awarded an ICASA Pay TV License on 12 September 2007 and issued the license on 9 July 2008 but started its operations in 2010. ODM offers easy access to commercial satellite subscription service for many South Africans who have historically been left out. ODM exists to provide relevant and easy to access entertainment to South Africans. On Digital Media (ODM) holds the broadcasting license for StarSat. South African shareholders will retain a majority stake in ODM on implementation of the business rescue plan. On Digital Media is currently in the process of concluding the implementation of a Business Rescue Plan, as voted on and adopted by its creditors and shareholders on 30 April 2013. This is a legally binding process that allows for the company’s affairs to be restructured whilst operating within the protective bubble of Section 6 of the Companies Act. Chinese pay television operator StarTimes will become a 20% percent Strategic Equity Partner in ODM on the implementation of the business rescue plan. StarTimes is one of the largest Digital Terrestrial Television (DTT) operators in Africa and has a subscriber base of 2.5 million customers. StarTimes is a worldwide technology company that was established in 1988 in China. It is a pioneer and key player in the pay-tv business in China where it has acquired over seven (7) million subscribers. Relying on its well-recognised outstanding performance and promising development prospect, StarTimes positions itself as the most influential broadcasting enterprise in China, having being listed among China's top 100 technology and science innovation-oriented enterprises, Forbes top 20 China's most potential enterprise and the only authorised private enterprise by the Ministry of Commerce in China to undertake foreign projects in the radio and tv industry. StarSat previously operated as Top TV. StarSat was officially launched on Thursday 31 October 2013. The new programming will be available from 1 December 2013. StarSat’s decoder is fully High-Definition (HD). The new platform offers new revised program bouquets at competitive rates, with more channels in each package. Existing TopTV customers will still be able to receive the StarSat signal on the old Top TV decoder. Existing and new subscribers will be given promotional material regarding the new pricing structures. Customers wanting more information on StarSat are encouraged to SMS STAR to 40004 and they will be called back or they can contact the call centre on 086 086 STAR. Viewers whose subscriptions have lapsed will be able to reactivate their subscriptions with the new StarSat package. anyone actuall y have a list of channels for us?